Charlestown,Nevis– (May 3rd, 2011) A busy week is ahead for Premier of Nevis, the Hon. Joseph Parry as he will be a guest speaker at an International Conference on Energy, host a Town Hall meeting and be the guest of a Mother’s Day Gala. The events are all overseas engagements. On Wednesday, the Premier leaves Nevis to attend the 4th CIEMADES International Conference held from May 5-7 at the Universidad del Turabo – Gurado in Puerto Rico. A special invitation from Caribbean Electric Utility Services Corporation has been extended to the Premier to discuss Nevis’ development of Geothermal and Wind energy. Accompanying the Premier to Puerto Rico will be Minister of Communications and Works, the Hon. Carlisle Powell and Permanent Secretary, Mr. Ernie Stapleton who will also participate in the Conference with brief remarks. On Friday, the Premier will travel to New York where he is scheduled to host a Town Hall meeting at 7pm at the St. Andrews Church, located at 781 Castle Hill Ave in the Bronx. Mr. Parry said he will discuss a range of issues and agendas all important to the development of the island. “I look forward to meeting and discussing the policies and achievements of my Nevis Reformation Party led Government and receiving suggestions and questions concerning Nevisians residing in New York,” commented the Premier. Deputy Premier, the Hon. Hensley Daniel and Minister of Housing, the Hon. Robelto Hector will also be speakers at the Town Hall meeting. On Sunday, the annual Mothers Day Gala organized by the Kittians and Nevisians Association (KANA) in New York will take place at Maestro’s at 1703 Bronxdale Ave in the Bronx, under the distinguished patronage of the Hon. Joseph Parry. The Premier is expected to deliver an address and will be introduced by Ambassador and Permanent Representative to the United Nations, His Excellency Delano Bart. The Mother’s Day Gala will also feature Calypso Monarch, King Konris of St. Kitts and King Meeko of Nevis. 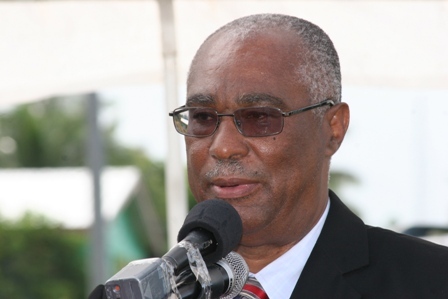 The Premier and his delegation are expected to return to Nevis on Monday, May 9th.